Medical aesthetics focuses on improving cosmetic appearance through the treatment of conditions such as scars, skin laxity, wrinkles, moles, liver spots, excess fat, cellulite, unwanted hair, skin discoloration, and spider veins. Laser and energy devices are most commonly used for skin and hair treatment including applications such as skin rejuvenation, tattoo removal, and skin tightening. Health concerns and rise in demand for technologically advanced products boost the growth of the global medical aesthetic devices market. The global market is estimated at US$ 7,798.20 Mn in 2017 and is projected to expand at a CAGR of 10.7% from 2018 to 2026. The global medical aesthetic devices market has been segmented based on product type, application, end-user, and region. In terms of product type, the market has been classified into aesthetic laser & energy devices, skin tightening & body contouring devices, aesthetic implants, and facial aesthetic devices. The aesthetic laser & energy devices segment accounted for major market share in terms of revenue in 2017. Utilization of aesthetic laser & energy devices is rising gradually due to increase in incidence of skin and aging problems across the world. The aesthetic laser & energy devices segment is expected to grow at a rapid pace owing to rise in health consciousness, especially in the West. Based on application, the global medical aesthetic devices market has been categorized into facial & body contouring, facial & skin rejuvenation, breast enhancement, scar treatment, congenital defect repair, reconstructive surgery, tattoo removal, and hair removal. The breast enhancement segment accounted for major share of the global segment in 2017, followed by the hair removal segment. Rise in demand for medical aesthetics is likely to contribute to the growth of the breast enhancement and hair removal segments. Demand for breast enhancement is high due to increase in awareness about beauty and physical appearance. In terms of end-user, the global medical aesthetic devices market has been divided into hospitals, dermatology clinics, and cosmetic centers. Hospitals was the leading segment in 2017 because these are the most favored settings for implantation and offer easy access to physicians. The hospitals segment accounted for the largest share of the global market in 2017, followed by the dermatology clinics segment. Demand for medical aesthetic devices is high in dermatology clinics due to requirement of proper assistance for interpretation of medical aesthetics for appropriate surgical process. Geographically, the global medical aesthetic devices market has been segmented into five major regions: North America, Europe, Asia Pacific, Latin America, and Middle East & Africa. North America accounted for the largest share of the global market in 2017, followed by Europe. This is attributed to well-established health care infrastructure coupled with efficient reimbursement system, and high demand for superior-quality aesthetic treatments. In terms of revenue, Germany and the U.K. dominated the medical aesthetic devices market in Europe in 2017. Asia Pacific is the most attractive market and expected to expand at the highest CAGR during the forecast period due to increase in consumer awareness about these products through social and traditional media and preference for procedures such as hair removal. The global medical aesthetic devices market is consolidated, with small number of companies accounting for majority share. Key players operating in the global market are Fosun Pharmaceutical Co., Ltd., Cutera, Inc., Cynosure, Inc., Lumenis Ltd., and Syneron Medical Ltd. Fosun Pharmaceutical Co., Ltd., Syneron Medical Ltd., and Cynosure, Inc. exhibit the widest geographical footprint, with presence in multiple medical aesthetic devices segments. This report analyzes the current and future scenario of the global medical aesthetic devices market. Increase in incidence of skin diseases, technological advancements, and rise in patient preference for minimally invasive surgeries are the major drivers of the global market. The report comprises an elaborate executive summary, which includes a snapshot that provides information about various segments of the market. It also provides information and data analysis of the global market with respect to segments based on product type, application, end-user, and region. A detailed qualitative analysis of drivers and restraints of the market and opportunities has been provided in the overview section. Additionally, the section comprises competitive matrix and company profiles with business overview to understand the competitive landscape in the market. 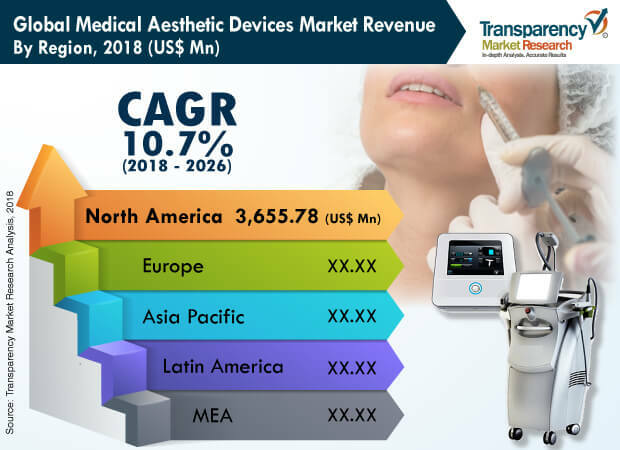 This section of the report also provides market attractiveness analysis by region and market share analysis by key players, thereby presenting a thorough analysis of the overall competitive scenario in the global medical aesthetic devices market. The global medical aesthetic devices market has been segmented based on product type, application, end-user, and region. In terms of product type, the global market has been divided into aesthetic laser & energy devices, skin tightening & body contouring devices, aesthetic implants, and facial aesthetic devices. The aesthetic laser & energy devices segment accounted for major market share in 2017. Utilization of aesthetic laser & energy devices is rising gradually due to increase in occurrence of skin and aging problems across the world. Based on application, the global medical aesthetic devices market has been classified into facial & body contouring, facial & skin rejuvenation, breast enhancement, scar treatment, reconstructive surgery, tattoo removal, and hair removal. In terms of end-user, the global market has been categorized into hospitals, dermatology clinics, and cosmetic centers. The market size and forecast for each of these segments have been provided for the period from 2016 to 2026, along with their respective CAGRs for the forecast period from 2018 to 2026, considering 2017 as the base year. Geographically, the global medical aesthetic devices market has been segmented into five major regions: North America (the U.S. and Canada), Europe (the U.K., Germany, France, Spain, Italy, and Rest of Europe), Asia Pacific (India, China, Japan, Australia & New Zealand, and Rest of Asia Pacific), Latin America (Brazil, Mexico, and Rest of Latin America), and Middle East & Africa (South Africa, Saudi Arabia, and Rest of Middle East & Africa). The market size and forecast for each of these regions and countries/sub-regions have been provided for the period from 2016 to 2026, along with their respective CAGRs for the forecast period from 2018 to 2026, considering 2017 as the base year. The research study also covers the competitive scenario in these regions. The report also profiles major players in the global medical aesthetic devices market based on various attributes such as company overview, financial overview, product portfolio, business strategies, and recent developments. Key players in the global market are Fosun Pharmaceutical Co., Ltd. (Alma Lasers), Mentor Worldwide LLC, Cutera, Inc., Cynosure, Inc., Lumenis Ltd., Syneron Medical Ltd., Merz Pharma, and Solta Medical, Inc.